(Warning: The following photos include actual surgical photos which might be graphic for some. What will I look like immediately after Asian Blepharoplasty? Photo before and immediately after Asian Eye Surgery or Asian Blepharoplasty. Asian eyelid anatomy is unique. Planning the shape of the crease is critically important. This is the surgeon’s view of the patient undergoing Asian Blepharoplasty. Local anesthetic has been injected under the skin. The right amount of local anesthesia has to be placed and allowed to be absorbed for some time before starting surgery. After making an incision with a scalpel or laser, Dr. Prasad performs Asian Blepharoplasty using surgical scissors to remove the skin. This is the appearance for Asian eye surgery after the skin has been removed. In Asian Blepharoplasty the fat prevents a crease from forming properly. 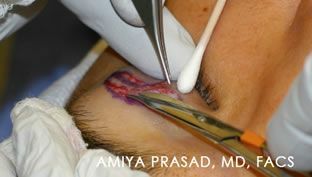 This photo shows Dr. Prasad has removed tissue to reveal the fat. In Asian Blepharoplasty using the incisional technique, Dr. Prasad opens the septum to allow the fat to come forward. After fat is reduced in Asian eye surgery, the levator aponeurosis is revealed. Proper attachment of the skin to this structure is critical to creating a crease or double fold. In Asian blepharoplasty, sutures are placed carefully with attachment to the levator aponeurosis thereby creating a double fold. 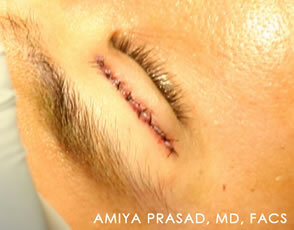 At the completion of the procedure of Asian eyelid surgery, the sutures are placed. There is a small amount of swelling. Ice compresses are used immediately to minimize swelling. 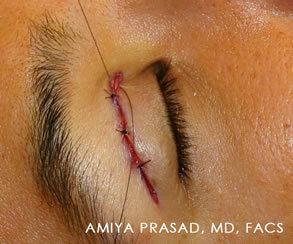 This is an example of a patient immediately after Asian eyelid surgery. The crease can appear higher than the final result because of swelling. Cold compresses are used for 2 days. This patient had no pain.